Crazy anti Hs2 campaigner of the week – special award.. This week the Hs2 antis have excelled themselves & one Frances Cutler has merited a special award for providing evidence that the anti Hs2 mob will stoop to criminality. 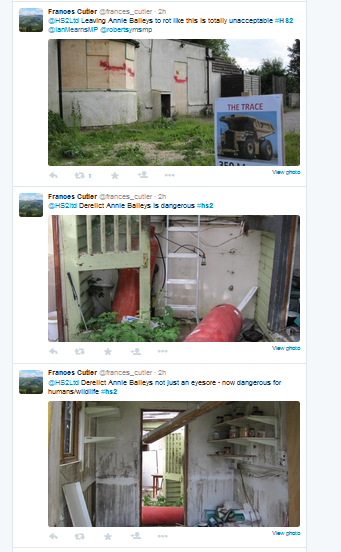 Her stupidly crude attempt to try & use these as ammunition against Hs2 Ltd has backfired spectacularly as its extremely unlikely these photographs were acquired legally. 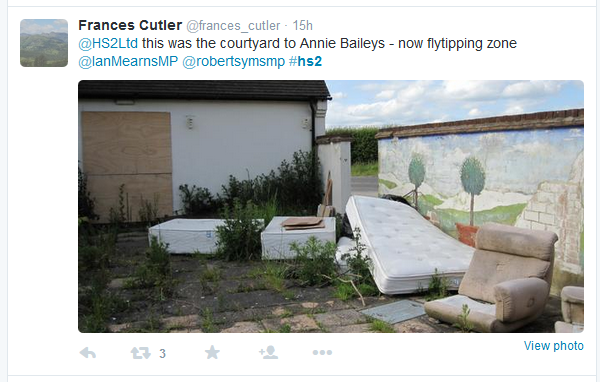 In other tweets she complains that anti Hs2 graffiti that covers the pub has been painted out. Of course, graffiti is also criminal damage, so she’s highlighted the fact the anti Hs2 campaign includes people happy to break the law on several levels. I have to ask, if the place is ‘dangerous to humans’ – what was she doing there? The irony is these are the people who complain about Hs2 ‘ruining’ villages like Gt Missenden. Yet they’re happy to cover it in graffiti & the countryside with unsightly placards. Talk about hypocrisy! 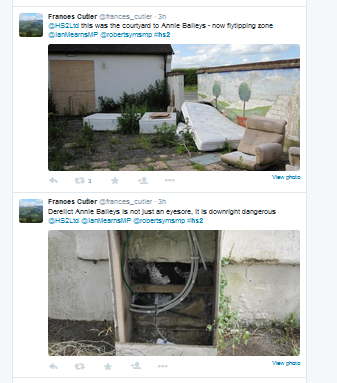 Perhaps Thames Valley police might like to talk to Cutler about how she acquired these photographs, who may have taken them & what she knows about graffiti attacks in Great Missenden? 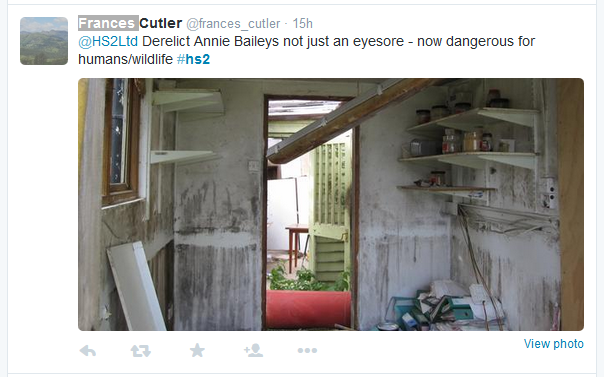 Whilst they’re at it, Thames Valley police might like to ask Cutler about this claim (in which she admits the pictures are hers). Clearly, the anti Hs2 mob think the laws of the land don’t apply to them. 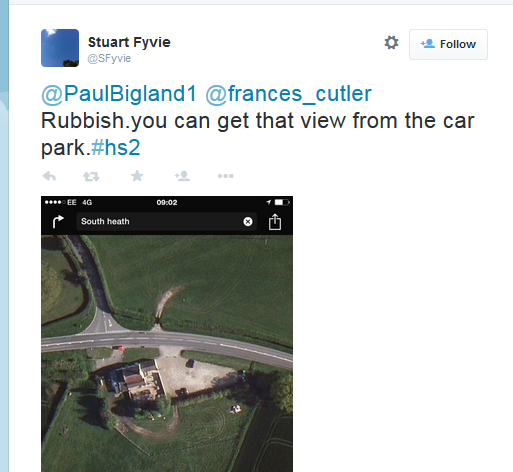 It didn’t take long for the anti Hs2 apologists to step in – although some of them managed to make things worse – like Stuart Fyvie, whose aerial shots confirms trespass at best!